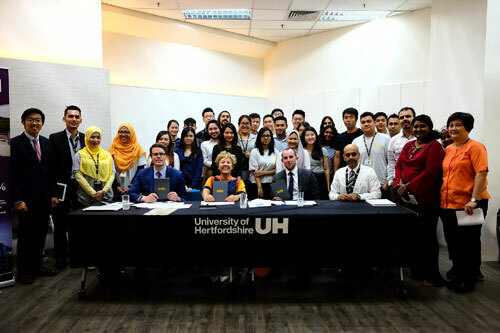 Students from INTI International College Kuala Lumpur (INTI) participated in the inaugural Dragon’s Den Competition, an event organized by the University of Hertfordshire, one of INTI’s long standing university partners. Students were required to develop and pitch innovative business concepts to three “Dragons”, representatives from University of Hertfordshire, including Julie Newlan, Pro Vice-Chancellor (Business and International Development); Stuart Smith, Head of International Recruitment; and Sam Poulton, Regional Manager of Europe and The Americas. As each of the judges were experts in different fields of business, students were required to think holistically and address multiple aspects of their ideas, reflecting real world business requirements. Participants of the University of Hertfordshire Dragon’s Den 2017 competition at INTI International College Kuala Lumpur. The Dragon’s Den Competition consisted of a 2-minute presentation of the students’ business ideas, which needed to be sufficiently well developed to influence the judges to select their business idea. The students were also required to develop a brief business proposal within 30 minutes and use their presentation skills to deliver their innovative entrepreneurial ideas within the stipulated time frame to the three judges. Navinder Singh, a final year student from the 3+0 BA (Hons) Business Administration, University of Hertfordshire programme emerged as the winner of the Dragon’s Den Competition. He was awarded a scholarship worth £4,000 (approximately RM 21,805.00) in tuition fees, by Julie Newlan. This scholarship will go to Navinder’s fees when he joins the September 2017 intake in University of Hertfordshire. Sharing his thoughts on being selected as the winner, Navinder advised future participants to not be afraid to present their ideas to the Dragons and to learn how to form a connection with the judges when presenting. “Don’t be afraid. Many people have brilliant ideas but don’t be afraid to present your ideas,” he explained. Group photo of the winners, faculty members of INTI International College Kuala Lumpur and representative of University of Hertfordshire. 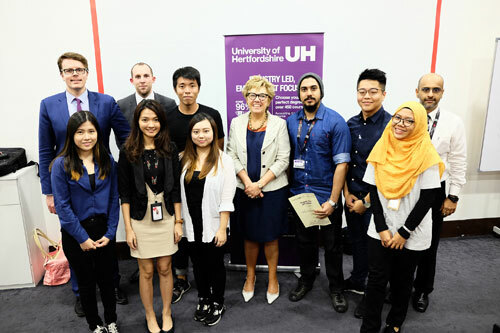 Second year students from the 3+0 BA (Hons) Finance, University of Hertfordshire programme, Ginny Cheah Boa Gin and Hiew Wei Lik were awarded as the first runner-ups in the competition. Both of them were awarded a scholarship worth £2,000 (approximately RM 10,902) in tuition fees. The second runner-ups were also second year students from the 3+0 BA (Hons) Finance programme, Wong Sue Ee and Teh Yun Lei; who were joined by Tommy Eng Yon Lek, a second year student from the 3+0 BA (Hons) Event Management and Marketing programme and Putri Sofea Asjad, a second year student from the 3+0 BA (Hons) Marketing programme. All four of them have been awarded a £1,000 scholarship (approximately RM 5,451) in tuition fees each. As a higher education institution which prioritizes the employability of its graduates, INTI recorded impressive graduate employability ratings in 2015, with 98% of INTI graduates being employed within six months of graduation, while 25% received job offers even before they graduated. 82% were also paid higher than the market average, highlighting their edge over their peers. With these figures having been validated by BDO Governance Advisory, INTI remains the only institution of higher learning who can vouch for its employability outcomes.